Huatulco In the late 1960's the Mexican government began an ambitious tourism development strategy. The goal was to identify new beach resort sites, and then build integrated master-planned resorts. The 35-kilometer stretch of pristine bays, coves and inlets known as the Bahias de Huatulco or Bays of Huatulco (wah-TOOL-co) in southern Oaxaca, Mexico was one section of coastline targeted. This world class resort has become Mexico's most ambitious tourism project. In fact, Huatulco is Mexico's first "ecotourism" resort. The majority of the project's approximately 52,000 acres are to be held as ecological preserves. Huatulco is one of Mexico's most relaxed destinations. 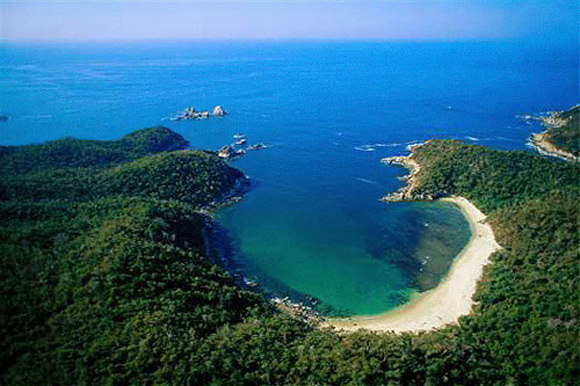 The centerpiece of Huatulco's appeal are the nine bays encompassing 36 beaches and numerous inlets and coves, each with its own unique setting and ecology. All are known for lovely beaches of golden sand and crystal clear water. Some are so primitive that they are only accessible by boat. Only three of the bays are "tourist ready" with visitor facilities. Tangolunda Bay is the grandest of Huatulco's bays, Santa Cruz is home to the marina and the the small city of Santa Cruz, and Chahue (CHAH-way)is the area's largest with three long stretches of sandy beach. Most visitors will visit these areas and the small, charming city of La Crucecita (about a mile inland). Huatulco is located in the beautiful, colorful state of Oaxaca and is only 40 minutes by air from the capital city of Oaxaca. Oaxaca City's awesome archaeological sites, colorful markets, rich colonial architecture and fascinating native cultures make a perfect match for Huatulco's coastal attractions. Huatulco is also an excellent gateway for exploring the coastal villages of Puerto Escondido and Puerto Angel, two of Oaxaca's coastal gems. Huatulco, too, is rich with ancient indian history. Zapotec, Mixtec and Aztecs merchants established and important trade route through the region. Following the conquest, the coastal village of Santa Cruz Huatulco served as a harbor and shipyard for the Spaniards, however, the establishment of the Acapulco-Orient trade route in 1560 led to an immediate decline in Huatulco's development. The settlement was raided by English pirates in the late 16th century, and the area's villages lingered for centuries as sleepy outposts. At present Huatulco's dining, shopping and nightlife are just emerging. Sightseeing includes popular bay tours, ecological excursions, beach combing, and horseback riding. The sports scene offers tennis, every imaginable water sport, and golf. Huatulco also has some of the clearest water on Mexico's Pacific coast, and their are some great diving and snorkeling spots. Putting it all together, Huatulco offers that hard-to find combination of deluxe facilities and an unspoiled natural setting. All this, plus the allure of nearby Oaxaca city, makes a Huatulco an enticing destinations.